I have been focused on teaching my kids about polar animals this winter. After we did our recent Arctic animals unit, I decided it was time to turn our attention to the most famous animals of the Antarctic: penguins! 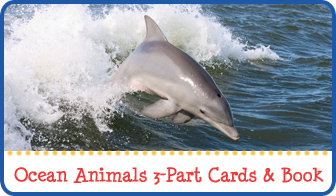 I planned a series of penguin activities to teach several lessons about these adorable animals. 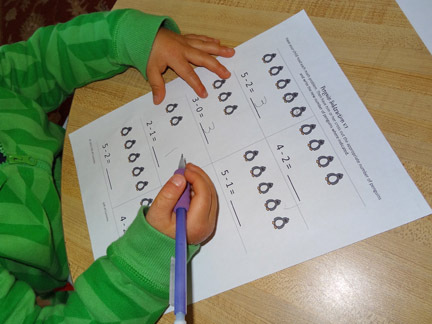 I also used my kids’ interest in penguins to teach some basic math skills. 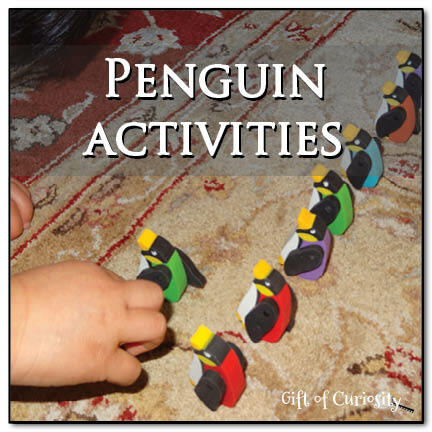 This post shares all of the penguin-related activities we did on a recent morning. The kids loved watching the videos, and together we talked a lot about how the penguins keep the eggs and baby chicks on their feet and under their tummies to keep them warm. The kids were so fascinated by this. We also read The Emperor’s Egg Big Book: Read and Wonder Big Book by Martin Jenkins. One thing we learned from the videos and books was that the penguins living in Antarctica huddle together in the winter in order to stay warm. So I planned a little game to underscore that point. 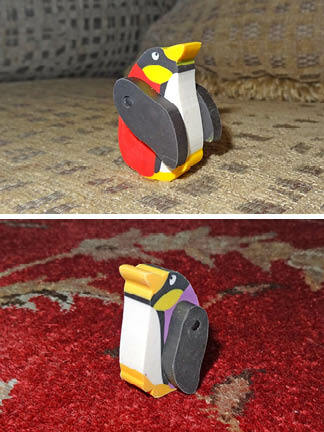 I had some small penguins that I scattered around our living room. I explained to the kids that the penguins were feeling very cold because they were not huddled together, and the goal of the game was to gather all the penguins as fast as possible to huddle them together again. The kids loved scrambling around the room to pick up the penguins. And then they huddled them together to help them stay warm. Next, we played a penguin math game. I gathered all of the penguins and put them into a pot. 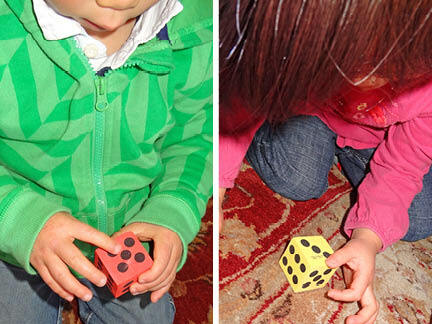 Then the kids took turns rolling a jumbo dice . 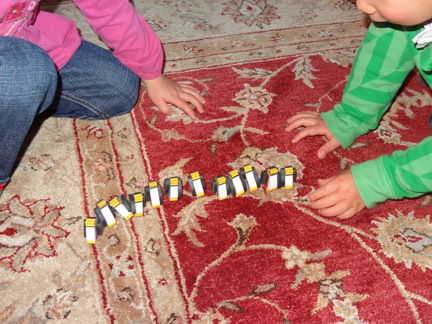 They had to count the number on the dice and then take that many penguins out of the pot to put into their pile. 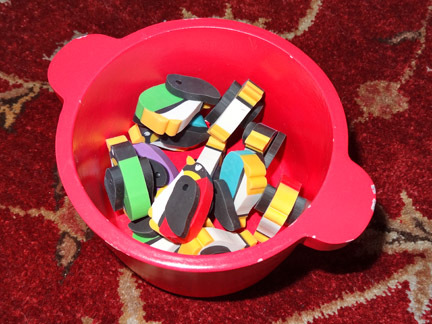 When there we no more penguins in the pot, we counted up the number in each kids’ pile. I decided to use this as a lesson in understanding quantity. We talked about which kid had more penguins than the other. 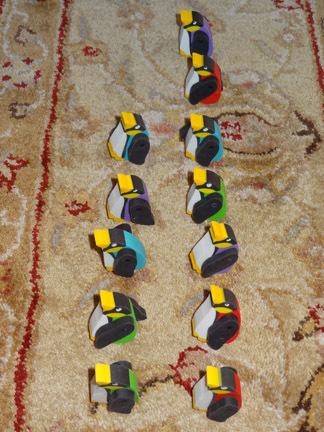 To make the lesson concrete, we lined up their penguins so we could visually compare which line was longer and had more penguins than the other. QBoy was able to see, in the case of the picture below, that his line had two more penguins than XGirl’s line. Then we tried another activity to simulate how the penguins hold their eggs on their feet and tucked under their bellies. 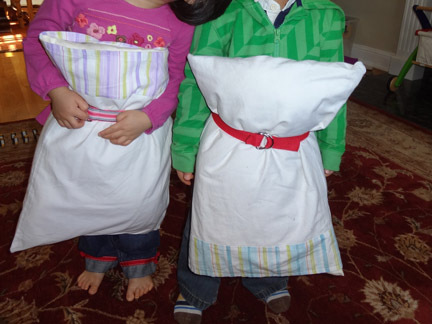 Using a belt and a small pillow, I fashioned a big tummy for both kids. Then I had them stand with their feet together while I put a “penguin egg” on their feet. Finally, both kids did some work on individual skills. QBoy did a few penguin-related math exercises. 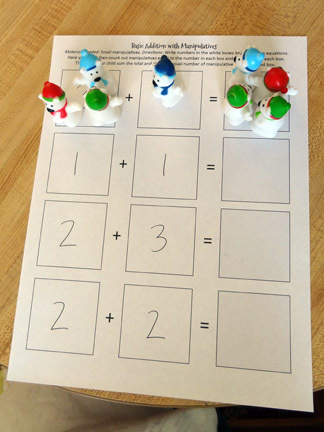 The first was this Penguin Subtraction worksheet from my Winter Printable Pack. 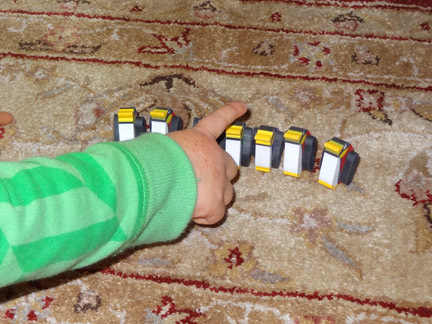 This next activity was supposed to have been done using the small penguins we had, but QBoy was still playing the role of daddy penguin and did not want to put them down as he didn’t want them to freeze. So we used polar bears instead. Using this worksheet I developed, QBoy had to recognize the number in each box of the equation, put that number of polar bears in each box, and then count the total and put that number of polar bears in the total box. And that’s what we did to learn about penguins! You’ll find more resources for learning about penguins and other polar animals on my Polar Animals and Lands unit study page and my Polar regions Pinterest board. 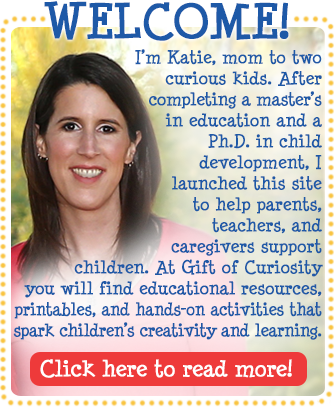 Follow Katie @ Gift of Curiosity’s board Polar regions on Pinterest. Oh that looks like they had so much fun! What fun! The pillow penguin tummy is adorable. 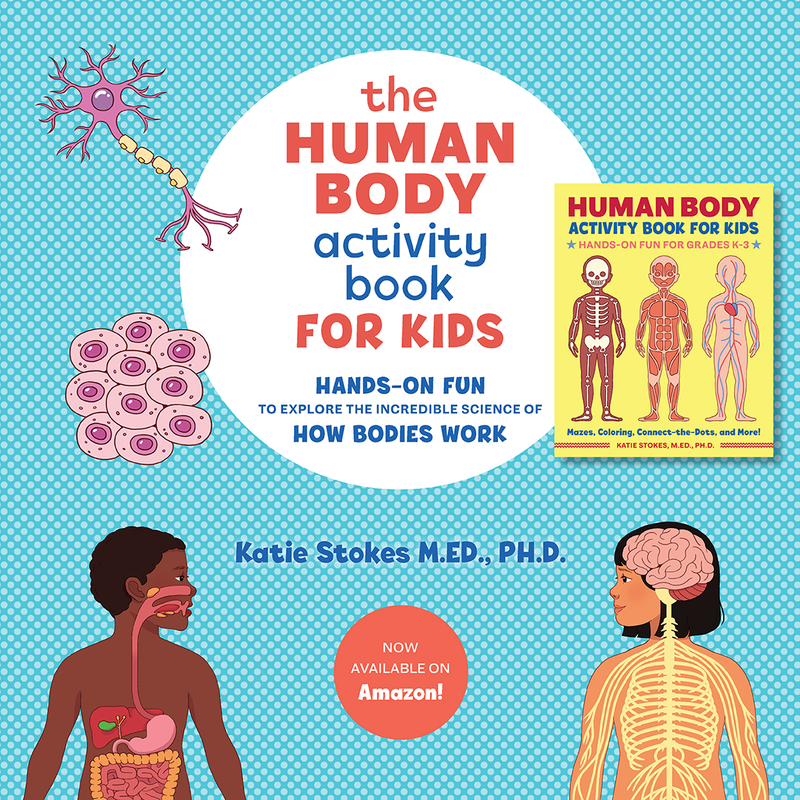 That looks like so much fun, Katie! You and Ticia have both given me inspiration to bring life into our study of animals when we move on from chemistry – thank you! Thanks so much. Best of luck with your animal studies! My son, in particular, really enjoys learning about animals. This is wonderful unit! I love the hunt for penguins and the egg balancing activity. What fun! I will be sharing this post on the Read.Explore.Learn. Facebook page and Pinterest Board. I’m glad you enjoyed it. We had so much fun learning about penguins. Thanks so much for sharing my post on your Facebook and Pinterest pages! Have you read the “Tacky the Penguin” books? They are hilarious! Tacky is this unique bird who does everything his own comical way. He makes me smile everytime I read them. Thanks for the amazon dice link, I’ve been looking for one of these dice for awhile now. 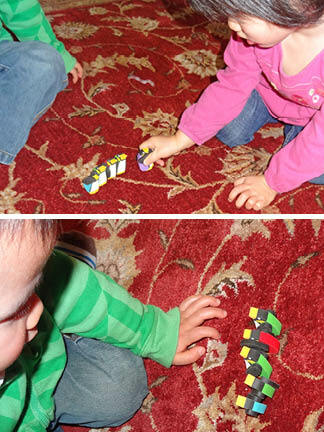 I hope your daycare kids enjoy these activities as much as my kids did! And I have heard of the Tacky the penguin books, but we haven’t read them. I think I am going to have invest in some before we revisit learning about penguins next winter. Thanks for the recommendation! Lol! Love the pillow belly activity. Penguins are my favorite animal! Thanks for sharing these wonderful activities at Mom’s Library. Great activities for a winter day! These are great activities. 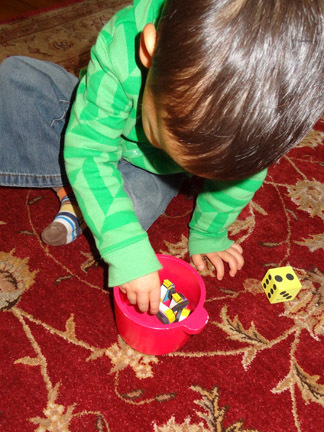 The math game reminds me of lining up little figures and working on patterns. We would have one standing then one laying down… or blue, blue, green. I also love that you tried to walk across the room without letting the eggs fall off. The kids will always remember that penguins carry the eggs on their feet. Thanks for linking with Hobbies and Handicrafts. What wonderful activities! Thank you for sharing at Sharing Saturday! I love the pillows on the bellies! We just wrapped up a penguin unit last week, and we waddled around with hard boiled eggs on our feet. A pillow would have been a great addition! 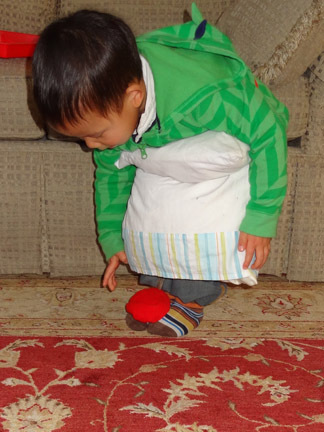 We found it impossible to keep the bean bags on our feet – I can’t imagine keeping a real egg on our feet!! I loved your activities! Especially the gathering them up to be warm and walking like a penguin with eggs on your feet. What cute ideas! We are quite fond of penguins too, so we may have to try some of these sometime! 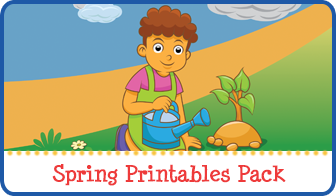 Thanks for linking to Mom’s Library! 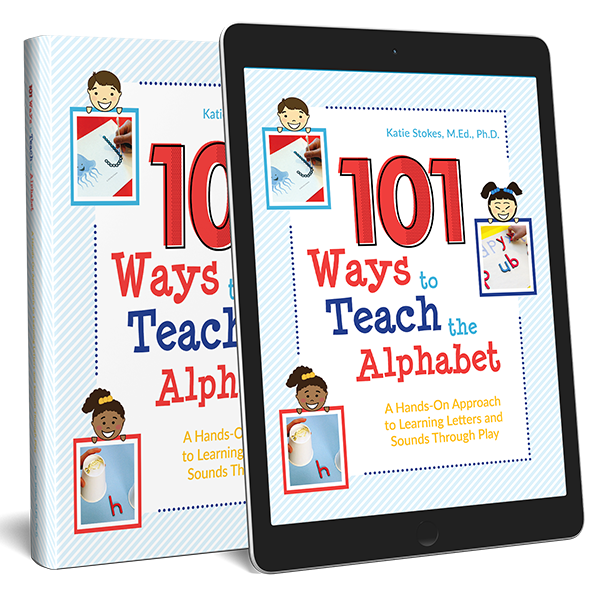 I will be featuring you this week on Mom’s Library! I hope you stop by! So much fun and learning here. You’re very innovative with your ideas. Thanks for sharing. Thanks so much! We had such a fun time learning about penguins. 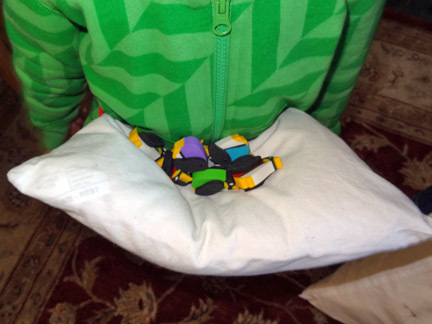 I love the creative ways you reinforce the lessons, like the ‘huddle the penguins’ game! featured this on the kids co-op!